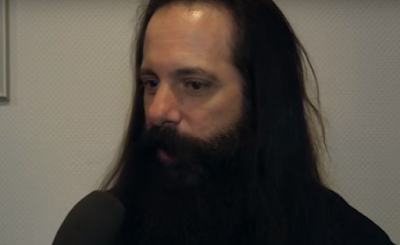 MetalRockNews: Dream Theater's John Petrucci: "People just don't have the time for music anymore"
Dream Theater's John Petrucci: "People just don't have the time for music anymore"
Dream Theater guitarist John Petrucci was recently interviewed by Session, you can read some excerpts below. About Dream Theater's current European tour in support of the band's concept album "The Astonishing", he said: "Well, here's an interesting thing. The way that this album came about, and the way the tour is, it's a two-act, two-CD concept album. It's a long show, and this tour is called 'Dream Theater Presents The Astonishing Live', which means we're basically just playing this whole show as it was meant to be. When we wrote it, we envisioned playing it as a standalone show, kind of like when Pink Floyd toured for 'The Wall' and they just went out and they played 'The Wall'. So there's no other Drea Theater songs, there's no encore, it's just this show. So we thought it would be better for the audience to kind of be seated and take in the whole thing, because there's a lot of visuals and everything else. In America, when we play, a lot of the venues are already theaters, like, let's say New York, the Beacon Theater, Radio City Music Hall… These are all big seated venues that normal concerts go on. But here in Europe, what's interesting is that the fans aren't used to us playing in seated venues. They say, 'Oh, it's weird not standing.' So it's like we're a rock and roll band, but we're playing in places where they normally have opera, ballet, musicals… stuff like that. And so the European audience is sitting and they're a little bit… at first, they're not sure what to do, and it might feel a little uncomfortable. But you know what? I was speaking to some people who saw us in Nürnberg last night, and they said that it was great, 'cause they were able to sit back and take in the experience of the show, which is what we wanted in the first place. So they're getting used to it." About the biggest differences in the music industry since Dream Theater started three decades ago: "A lot of it, actually, it's kind of… To tie it in with 'The Astonishing' and the story, it kind of is an underlying theme that's in the story, which is that… There's a line and it says, 'People just don't have the time for music anymore.' And what I was referring to is now, the way that we listen to music and consume music is a lot more passive and it's a lot more on the go. So you're able to stream things quickly. You might not even listen to it in the best circumstance; you might just be using some earbuds and your phone or something. You download a song, not a full album. It used to be you had to go to a venue to go see music in order to be able to hear it. So in my story, in this concept album, it takes place three hundred or so years into the future, and music is no longer made by people; it's made by artificial intelligence, by machines. It's kind of a commentary on what would happen if music becomes so unimportant. So the biggest change, I think, between when Dream Theater first started, to answer your question, and now is just the way that we consume music, listen to music. Again, people can access music a lot easier, but there's kind of a negative side to that where people don't really sit down, take the time and take it in. I can remember listening to albums by Rush and Pink Floyd and stuff like that, and just putting on the entire thing, shutting off the lights and getting into it just the same way you would watch a movie."